The Happy Camp to Dillon Creek section is merely a 23 mile section of the 100 mile stretch of the Lower Klamath. This is the most popular section of the river but whitewater rafting trips can be extended by putting in up higher and taking below the Happy Camp section. 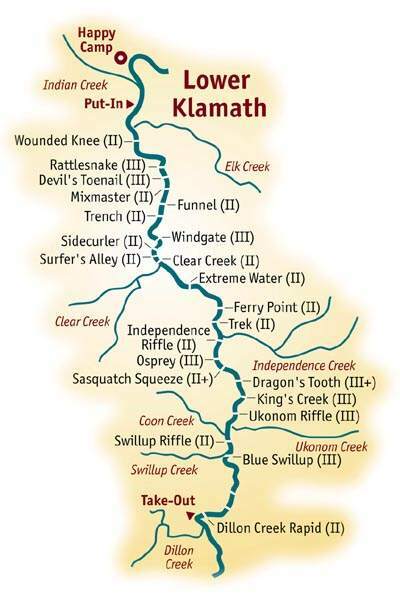 The rapids listed below have an approximate mileage and level of difficulty. Have a good trip!! Mile 7.0: Sidecurler (class II). Mile 11.0: Trek (Class II). Mile 19.7: Elliott Creek enters on the right.